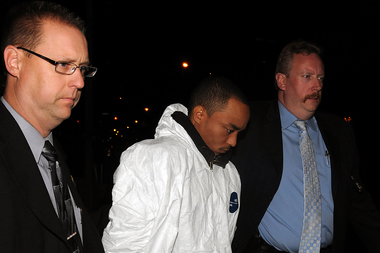 Tyrone Howard is walked into Manhattan Criminal Court after being charged with shooting Officer Randolph Holder in East Harlem, Oct. 21, 2015. EAST HARLEM — The man suspected of gunning down NYPD Officer Randolph Holder Tuesday night had an extensive criminal history and “sure as hell shouldn’t have been on the streets,” according to Mayor Bill de Blasio. 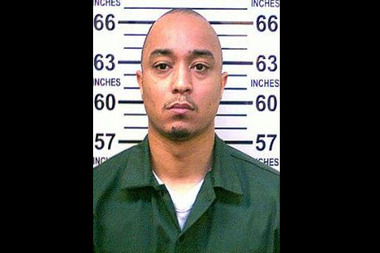 Police identified Tyrone Howard, 30, as the shooter who killed the five-year NYPD veteran in a gunfight in East Harlem. Dozens of police officers stood in solidarity outside Manhattan Criminal Court on Wednesday night as Howard was escorted in. He is charged with first-degree murder and robbery for the officer's death. The suspect had been arrested in a major 2014 drug bust at the East River Houses and was most recently wanted by police for a Sept. 1 shooting. Police identified Tyrone Howard, 30, as the suspected gunman in Tuesday's fatal shooting of NYPD Officer Randolph Holder. He was previously released on bail in relation to the drug charges and ordered into a treatment program, according to his plea agreement. Manhattan District Attorney Cy Vance Jr. also opposed the prison diversion program, which allows alternatives to prison for people convicted of non-violent drug misdemeanors. "I am deeply angered and saddened by the senseless murder of Police Officer Holder," Vance said. "We recommended state prison for the defendant and opposed his request for diversion." Court officials countered the finger-pointing, saying the suspected shooter would have been released regardless of such services. “The defendant was out on $35,000 bail, which is not a low bail, and would still be out of jail if he weren't in a diversionary program," Office of Court Administration spokesman David Bookstaver said. "Let's place the blame where it belongs — with the person who has been charged with this heinous crime." Manhattan Supreme Court Justice Edward J. McLaughlin proposed a drug treatment in Howard’s drug case, according to reports, and defended his decision following Tuesday’s fatal shooting. Howard had no convictions for violent crimes at the time of his decision, the judge said, and a social worker’s report noted that Howard would benefit from treatment. “When you get a robe, you don’t get a crystal ball,” McLaughlin told The New York Times. Howard had been arrested and charged in a 2009 shooting in the East River Houses in which an 11-year-old and 77-year-old were struck, sources said. But charges against him were dismissed after police couldn't find any eyewitnesses. McLaughlin was unaware of the arrest, according to reports. On Tuesday, Howard shot the officer in the head after fleeing from a shootout between individuals at East 102nd Street and stealing a bike, officials said. Prior to the fatal incident, police attempted to apprehend Howard at least 10 different times since the start of September for a drug-related shooting at the East River Houses that injured a 28-year-old man, officials and sources said. He also fled the scene on a bike, sources added, and failed to show up at several court appearances. “We went hunting him but were obviously unsuccessful,” James O’Neill, the NYPD’s chief of department, said Wednesday. Howard, who was a member of the East Army Crew street gang, had also been sent to state prison twice on drug-related charges, records show. Bratton joined de Blasio Wednesday afternoon in calling for reforms in the city’s criminal justice system, saying that violent offenders should be kept in jail. Thousands of people convicted of nonviolent crimes end up in prison, even as some hardened, violent criminals never serve time, de Blasio said. “That’s a world out of balance, that’s something we have to fix,” the mayor said.